We’ve been having a conversations with many of you about the cloud and the way it impacts your data and analytics strategy. As the size and complexity of data grows, the cloud can offer new ways to help address it and provide new ways to get value. The speed of deploying the right amount of infrastructure, the freedom to utilize limitless capacity, and the ability to more easily connect to innovative services like machine learning are all benefits a cloud-centric approach offers. The cloud has been an important area of focus in our work with customers and our product development. Thousands of our customers depend on Amazon Web Services (AWS) to deploy data and analytics in the cloud. The flexibility, scalability, and reliability of the AWS cloud services coupled with the intuitiveness of Tableau’s visual analytics platform provide a modern approach that is both agile and secure. Our partnership focuses on the deep integration of Tableau and AWS technology so that you can depend on fast and flawless performance for the use cases you need. Native connectors from Tableau to AWS services ensure you experience optimal performance when connecting to and analyzing data in the cloud. It also ensures the full capabilities of AWS services work seamlessly when you are using Tableau. Examples of existing native Tableau integrations include Amazon Redshift, Amazon Redshift Spectrum, Amazon Aurora, Amazon Athena, and Amazon EMR. We are demonstrating a new integration with the Amazon SageMaker machine learning (ML) service at the Tableau Conference this week in New Orleans. ML is an active area of innovation today, offering new ways to find patterns in data. But it remains beyond reach of many of us who lack the specialized skills and training of data scientists and ML experts. We want to make advanced analytics like machine learning accessible to more people. Coming soon, the Tableau Extension for Amazon SageMaker will enable you to to build, train, and deploy SageMaker ML models directly from a Tableau dashboard. Customers who want to try it out can sign up for the pre-release. Another way we work closely with AWS is to help you deploy solutions faster and more confidently. Our technology experts work together to figure out the best configurations, based on their deep knowledge and real-world deployment experience. 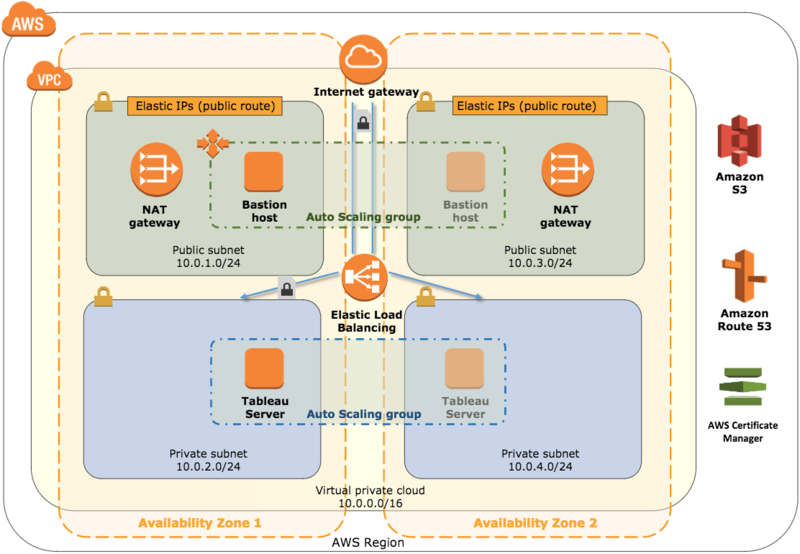 We document these configurations and turn them into Quick Starts, solutions that AWS offers to help deploy popular solutions on AWS. For example, the Tableau Server on EC2 Quick Start helps deploy a production-ready Tableau Server instance or high-availability cluster in minutes, and the Modern Data Warehouse Quick Start deploys an enterprise data warehouse environment based on Amazon Redshift and connected to the visual analytics capabilities of Tableau Server. Today we announced a new Tableau Server on AWS Healthcare Quick Start. With common security controls like end-to-end encryption already preconfigured, healthcare customers can now quickly and easily deploy a modern analytics solution that supports their HIPAA compliance programs out of the box. Great cloud analytics require more than great software and cloud infrastructure. As such, we’ve been working with system integrators (SIs) that have a lot of expertise on how to architect for the cloud, how to smoothly migrate to the cloud, and how to build a governance framework that is designed with the cloud in mind. Customers recognize that moving data and analytics to the cloud can be an opportunity to reexamine their architecture and find new opportunities to optimize. Many of our customers are already taking advantage of the native integrations and optimized deployments Tableau and AWS offer. For example, Sysco deployed Tableau on AWS, integrating as well with Amazon Redshift, Amazon EMR, and Amazon Athena. We want to hear your feedback on where you need our focus most to help you on your cloud analytics journey. To learn more about our work with AWS, see the Tableau AWS solutions site.